A lot has been written about the Duchess of Sussex in recent months, from speculation on her relationships with other members of the Royal Family to endless discussion of how much she cradles her baby bump. Now even her accent has become a topic of debate. When clips of Californian-born Meghan speaking are shared online, the same suggestion often pops up: Has she adopted a British accent? Some speech experts say they can hear a change, but others are not convinced. "There does seem to be something in the idea that Meghan Markle's speech has changed a bit, at least in some settings," said phonetics and pronunciation specialist Dr Geoff Lindsey. "There are occasional vowels which sound a bit more British," he said, while conceding it was tricky to make absolute statements. 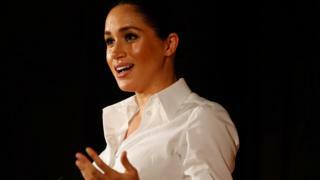 One example is her more British pronunciation of the word "all" when she met crowds in Cheshire in June 2018, compared to her pronunciation of the same word in her and Prince Harry's engagement interview in 2017, he said. But "the differences are subtle," said Dr Lindsey. And Dr Lindsey, an honorary linguistics lecturer at University College London, added that her intonation is more British than American when asking the yes/no question: "Did you make that for us?" in a clip from Birkenhead in January 2019. Marisa Brook, assistant professor in linguistics at the University of Toronto, said the duchess has "developed a style that sounds very English-aristocratic for interacting with the public". Among the examples she highlighted was the duchess saying "I do appreciate that" in the same clip from Birkenhead (above) in January 2019. "The vowel in 'that' is further back in the mouth than you would expect for American English," said Dr Brook, suggesting it could be a consequence of living in southern England. Dr Brook, who has studied accent changes in high-profile figures, said: "I think a lot of it is deliberate on her part. "She's developed a style to be used when directly talking with the British public. "These are the situations where people might be judging her in public instantly, where it really benefits her to sound British and aristocratic." "If it's conscious, I don't think it makes her manipulative, or a poser or anything," said Dr Brook, who attributes any change to the duchess's "unique position". "She's someone who's very off-beat from those who usually join the Royal Family - it makes a lot of sense. It's not that she is changing who she is. "It's like she's changing how she dresses - it's like an extremely fancy outfit. "I would call it a reasonable resource for her to draw on, given how unlikely her change in circumstances - and how dramatic." Phonetics professor Jane Setter, from the University of Reading, agrees there is some difference in the duchess's vowel pronunciation in public since her move to the UK, but "it's not huge". Professor Setter said the crowds "will make a difference" because of something called accommodation, which is when people adapt their speech - consciously or unconsciously - to the people they are talking to. "We all do this to some extent - speak differently with different people," said Professor Setter. "In a social role like the one Meghan is now in, where she has to meet lots of people and basically make a good impression on them in a short space of time, the ability to do this is very useful. "But it would be weird to take this too far. I don't think British people would accept her if she suddenly started sounding like she was in the cast of EastEnders - or spoke like the Queen. "She is who she is and it's important that she is genuine. Speech is part of that." Accents can reflect various things about people, said sociolinguist Dr Ella Jeffries, from the University of Essex - not only our background, but also our affiliations and aspirations. And for someone like the duchess, whose success may depend on trying to fit in, accent changes can happen naturally and fast. "Lots of different factors play a role in who accommodates, how they accommodate and why," said Dr Jeffries. "Someone who has a strong affiliation with the region they grew up in and is very proud of their heritage for example, might not change the way they speak much - even if they move to another part of the country, or even abroad. "However, someone with lots at stake in trying to 'fit in' or sound like they belong to a new in-group - British royalty, in the case of Meghan - might find accommodation happens quite naturally and quite quickly." Could her background in acting play a role in how easily her accent might change? "Certainly any potential accent coaching she has had will have made her more aware of the differences - and potentially better at mimicking them," said Dr Jeffries. "But on the other hand, maybe she therefore has better control of her accent than others and if she decides she wants to, might stay staunchly American sounding." But overall, Dr Jeffries said she did not hear much evidence of the duchess sounding more British. And Professor Paul Kerswill, a sociolinguist from the University of York, is even less convinced, saying "there really isn't much to go on". "Meghan is pretty consistent in her accent... whether acting a 'FedEx girl' in 2011, or a lawyer in Suits the same year," he said. "In the interview with Harry, the same thing applies: the only point where I felt there was some Received Pronunciation creeping in was in the word 'roasting', where the vowel is central and not back." Interestingly, he added that the duchess's clothing could be a reason for any perceived accent change. "It's been proved that appearance, ethnicity and age all influence what we think we hear, even when there's no difference in what is being played back in the audio," said Professor Kerswill. In American English, "all" is pronounced more like "ol" whereas Britons pronounce the word "orl". The duchess uses the more British "orl" when saying "Yes, we all had a good day I think," says Dr Jeffries. In words ending with "t", American speakers typically sound the final "t" more weakly. Speakers of standard British English explode the "t" - which means pronouncing it strongly, like at the beginning of a word. The duchess seems to do this, says Dr Lindsey, when she says "sweet" here and here. In questions which require a yes/no answer, such as "are you okay? ", Americans typically just use a rise in intonation, whereas in British English the pitch falls and then rises. Dr Lindsey says the duchess adopts the British style when she says: "Did you make that for us?"